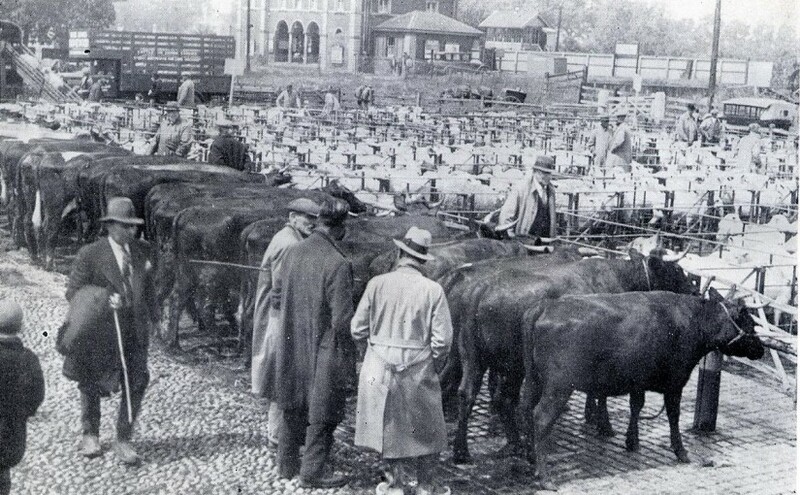 This remarkable account of Rye Cattle Market taken from a 1937 Handbook demonstrates how well Rye Cattle Market was doing in the period just before World War Two. This success was carried into the forties and fifties. From 1970 onwards support dwindled. The Market was closed as a result of the Foot and Mouth outbreak at the beginning of the Millennium . Sadly it failed to re-open and is now a car park. 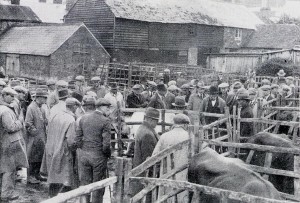 The market of Rye had its origin in very similar manner to many other of Britons market places, for in the first instance, due to edge of Romney Marsh so famous for its sheep, Rye proved to be ideally situated and an easily accessible centre for the gathering of producers for the purpose of bartering their livestock and other produce and commodities. For many years, the market was held on the site of the Market Road and highway of Cinque Port Street, the Tolls being collected by the Pomfret family who were local landowners and Bankers. During the nineteenth century, owing to the increased use of highways, expanding trade and a general desire for more convenient and effective penning arrangements, the farmers and dealers of the district held Meetings, convened with the object of providing a sufficient space for the holding of markets without interfering with the activities of the local tradespeople and travellers passing through the town. As a result of this series of Meetings it was most evident that there was a genuine desire for a better market for the purchase and sale of livestock, and a Company was incorporated in the year 1859 with the registered name of “The Rye Cattle Market Company Limited”, which was subscribed to and supported by local farmers, dealers and tradespeople. The objects of the Company as set out in the Memorandum of Association were “to provide a new Cattle Market site at Rye with the requisite fittings, erections, road-ways, buildings and the doing of all such other things as are incidental or conducive to the attainment of such objects”. From the Company’s records it may be noted that having accomplished such worthy aim, the Directors have done their utmost to keep such objects in view and to maintain and develop the market to the fullest possible capacity with the resources in their power. Upon the Company’s formation, a plot of land was acquired from the Rev. George Augustus Lamb, who had entered into a Contract for sale in respect of such land from the South Eastern Railway Company. The site consisted of two acres of level ground adjoining the Railway Station, being situated close to the centre of the town and convenient for producers of the surrounding districts. 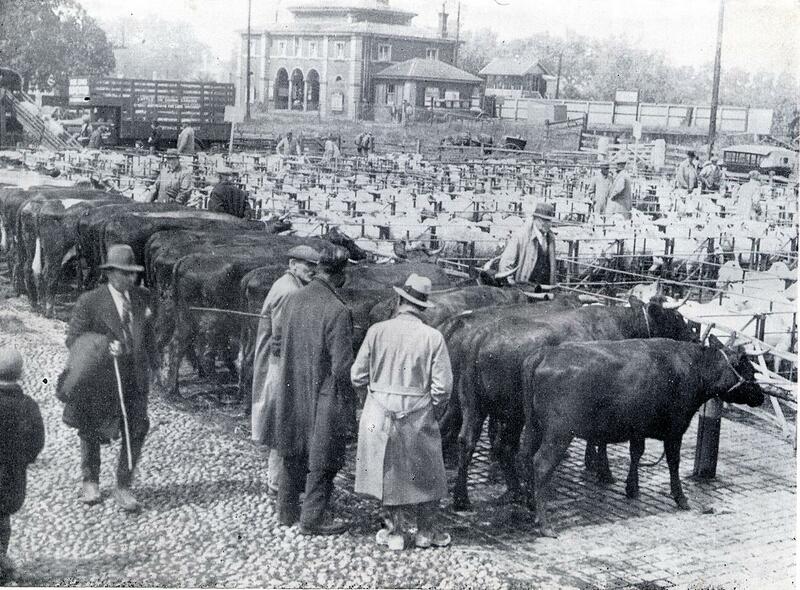 The Rye Market is owned by the Rye Cattle Market Company Limited, which is now in its seventy-ninth year of business. The market remains upon the site where it was originally established in 1859 and is still situated for the holding of sales. The market premises are well preserved and are maintained in excellent repair. All permanent pens are of iron with cement or brick foundations and are cleaned and scrubbed after every market. The market is controlled by the Company’s Directors who are composed of practical agriculturalists fully cognizant with the local conditions and requirements The Company have always shown that they are prepared to receive helpful suggestions for the improvement in any connection with the market or the working thereof. Markets are held on alternate Wednesdays for general sales and business. Special markets for sale of sheep and lambs, an annual ram sale and special Christmas Market for the sale of fat stock are also held, notices of same being displayed beforehand. A produce sale is held at the Market Hall on alternative Fridays previous to Market day. There was also a considerable head of poultry and a large quantity of eggs, fruit, vegetables and other produce sold in the market. district is most conveniently placed for the sale of much stock. As many as 4,990 fat sheep and lambs have been sold in one day of an ordinary market. A spacious section of the market is therefore reserved for sheep, comprised of iron pens, the floors being paved with bricks or asphalt. Total accommodation for sheep is 5200. The special sales for sheep and lambs are usually held in July and August and these attract a great number of buyers from adjoining Counties. A Ram sale is also held in October, at which stock from the well-known flocks of Romney Marsh are offered for sale. There is a steady supply of Fat Cattle throughout the year and accommodation is provided for 200 beasts. The market has been authorised as an approved centre for the sale of Fat Cattle under the Cattle Industry Emergency Provisions Bill, 1934 and 36, which has resulted in a considerable increase in the number of beasts entering the market. There is a fair trade for calves and covered accommodation for 150 animals is available. The pig market is situated in a sheltered section of the market place, the pens being of iron with brick or asphalt floors, the majority of which have corrugated sheets along the sides as a protection against the elements. 1928 Entries – 1477, 1937 Entries – 3762, being an increase of 2285 for the year. There is an accommodation for 250 fat pigs. The Corn Market was for many years held at the “George Hotel” Rye, and was transferred to the new Market premises in the year 1860. Corn Merchants and Dealers have their stands in the main Market Hall on ordinary market days, where a steady business is well maintained.